This is intended to be a resource for people with disabilities (and their families and caregivers) where we provide access to information, support networks, government programs and much more. A family friendly information site. 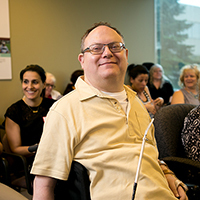 ARCH, A Legal Resource Centre for Persons with Disabilities, is an Ontario-wide community legal clinic and legal resource centre for individuals with disabilities. All the information you need regarding the Accessibility for Ontarians with Disabilities Act (AODA). The Accessibility for Ontarians with Disabilities Act, 2005 (AODA) became law on June 13, 2005. Under this landmark legislation, the government of Ontario has developed mandatory accessibility standards that identifies, removes, and prevents barriers for people with disabilities. The commission ensures the protection of the Human Rights Act. Information about the Canadian Federal electoral system. They provide legal services for those on a low-income. They provide both advice and referrals. Is the Action Plan will that strengthen the foundation Ontario has built since 2005 to becoming a fully accessible province and to continue to build momentum to drive us forward to completion in 2021. The Foundation's mandate to help communities discover the benefits of barrier-free spaces and providing the support to create them. A public policy centre dedicated to establishing the independence and social inclusion of people with disabilities. Augmentative Communication Systems – ZYGO Industries, Inc. Since 1974 ZYGO has been manufacturing and distributing augmentative communication technologies. Clothing Solutions has a wide selection of clothes that will make daily living much easier. Clothing is specifically designed to make dressing a simpler task. Hollister is a manufacturer of healthcare products, including ones for ostomy, wound and continence care, and breast-feeding. Programs for dog guides for people with disabilities. Shoppers Home Health Care is a retailer of a complete selection of specialty home health care products and services. Silverts is a retailer of accessible clothing for the elderly and people with disabilities. AccessNow is an app that shares accessibility information about places around the world. Information about accessibility features for Apple products. Outlines the services available through the Assistive Devices Program. Visit this site to find out which categories of assistive devices are covered under the program and which are not. Systems Integration & Research Services Inc.
A provider of home automation systems. Wheelchair lifts and van conversions as well as wheelchair accessible vans for sale. Mobility products including scooters and all terrain wheelchairs. Innovative products to help solve the most difficult accessibility challenges. RD Equipment designs products to promote accessibility and independence for the elderly and disabled. Manufacturer of homecare and extended care products: mobility products, respiratory products, daily living aids and assistive technology. Provides a wide variety of services and supports to people experiencing mental illness and their families. The Brain Injury Society of Toronto – (BIST) supports people living with the effects of an acquired brain injury and their family members. Community Heard Injury Resource Services (CHIRS) provides community-based support and rehabilitation services to adults living with the effects of an acquired brain injury. The latest on Huntington disease research news written by scientists in plain language. The Huntington Society of Canada provides counselling services to individuals and their families living with Huntington disease. Information about learning disabilities for parents, teachers and professionals. Information on where and how to access supports to overcome multiple sclerosis related barriers, information on the nature of the condition, and many other items of interest. At this bilingual (English/French) site you can learn about the recent developments in muscular dystrophy research, resources available to those with the condition and what you can do to make the supports available more effective. Support for people with CP in Ontario, with a wide range of services, resources, and programs. Information about the services that are available to people with Multiple Sclerosis in the Greater Toronto Area. ONF is committed to reducing the impact, incidence and prevalence of neurotrauma injuries by helping individuals participate as full members of society. The Spina Bifida and Hydrocephalus Association of Ontario provides information as to the medical nature of these two conditions. Champions excellence in service, advocacy, and quality of life for people with spinal cord injuries. See also Spinal Cord Injury Canada. Discusses Orders-in-Council in relation to ODSP. Information on financial assistance available to college and university students in Ontario. The Ontario Trillium Foundation provides financial supports to non-profit community groups based in Ontario making contributions towards social/community well-being. The Anne Johnston Health Station (AJHS) is a not-for-profit community health centre providing a wide range of programs and services that promote the health and well-being of youth, seniors and people with physical disabilities. Family Service Toronto is a non-profit social service agency that provides a variety of counselling, community development, advocacy and public education programs. Their services are available to everyone who lives or works in Toronto. Harmony Place Support Services (HPSS) is a not-for-profit organization that provides day programs for adults with developmental and/or physical disabilities. The focus at HPSS is to provide services that blend respect, dignity, choice, and advocacy with meaningful connections to the community. This is the website of the Canadian federal government. It contains extensive links and information on government services and programs. A health services directory of health and health-related services, programs and organizations. The Luso Canadian Charitable Society is a community based organization that supports diverse families and adults that are living with developmental and physical disabilities to reach their full potential. Provincial government site for information and links on issues such as how to start a new business, what resources are available to run and maintain a business, resources available for your personal financial assistance, scam alerts, etc. Montage is a non-profit registered charitable organization that provides residential and community support to adults with physical and developmental challenges. Building on a foundation of individual abilities and personal dreams, they develop innovative and inclusive services that encourage meaningful participation in each person’s community. Information on accessibility, education, employment, financial supports, health, housing and residential issues, personal services, rights, reports, publications, fact sheets, resources, tax programs, transportation and more. Located in the heart of downtown west Toronto, they offer a wide range of programs, services and opportunities for people of all ages and from all walks of life. Our work is about supporting individuals and families, strengthening communities and building a better Toronto. The Tobias House Resource Centre, established in 2000, is a program of Tobias House Attendant Care Inc. The Centre’s programs and services were developed to address needs that fall outside the scope of attendant care services. With four full-service locations, Unison offers core services that include primary health care, counselling, health promotion, early years programs, legal services, harm reduction programs, housing assistance and adult protective services as well as special programs like Pathways to Educations and Diabetes Education and Prevention. West Park is a public hospital located in West Toronto that helps individuals manage difficult health challenges like lung disease, diabetes, stroke, amputation and musculoskeletal issues. They offer – specialized rehabilitation, complex continuing and long-term cares services and community health services. Centre for Independent Living in Toronto (C.I.L.T.) Inc.
C.I.L.T is a resource centre that operates on and promotes the philosophy of Independent Living. Visit this site to view the extensive range of resources and services offered, including the administration of the Direct Funding program. The Institute’s purpose is to promote the opportunities of persons with disabilities to gain more personal and political power, self-determination, full participation and equality through information, training materials, consultancy and technical assistance. The Active Living Alliance provides opportunities for participation for individuals with physical disabilities in fitness and sports activities. They are a volunteer non-profit organization dedicated to the promotion of skiing for persons with disabilities. The Community Association for Riders with disabilities is dedicated to improving the lives of children and adults through quality therapeutic riding programs. The Disabled Sailing Association of Ontario (DSAO) is dedicated to providing people living with a disability the opportunity to learn about and enjoy sailing. Online version of Active Living Magazine. Full Radius Dance promotes modern dance for the general public, dance artists and people with disabilities. The company works with the talents of both dancers with or without a disability to promote diversity in our society. Tangled Art + Disability is a an arts organization that is dedicated to enhancing opportunities for artists with disabilities. They offer a wide variety of entertaining/educational events, exhibits, and classes. Through their integrated sports and recreation programs and services, Variety Village makes a profound difference in the spirits and lives of people with disabilities and their families in the greater Toronto area and across Ontario. e-Bility provides information about accessible transportation, accessible travel spots, relationships, sexuality and more! You must register to join e-Bility. It’s Free! Information on renting or buying accessible vans, on disability travel and other disability related resources. This website provides information about cruises, national parks, smart travel tips, tipping guides, destination guides as well as bargains and precautions that should be taken when traveling. Google Maps will help you reach your destination. All you need to do is enter the address or intersection of your destination and Google Maps will map it out for you. Then you can print out the map and begin your journey. The Society for Accessible Travel and Hospitality is a non-profit organization that promotes accessible travel for people with disabilities. Providing a specialized wheelchair transit service to individuals with special needs. Volunteer Canada is the national voice for volunteerism through ongoing programs and special projects.